Alright supermoms, it happens to all of us at some point. We drop the ball. Whether it be a lunch we forgot to pack, a practice we forgot to attend, or a tooth fairy that did not appear. With everyone’s busy life sometimes you just forget. And that’s ok! Loosing a tooth is usually a big deal for kids. They feel like they are getting bigger, and that they have really accomplished something by getting that wiggly tooth out (you know, the one that have been messing with for at least 2 weeks by now? Yeah! We are excited it’s finally out now too aren’t we?). 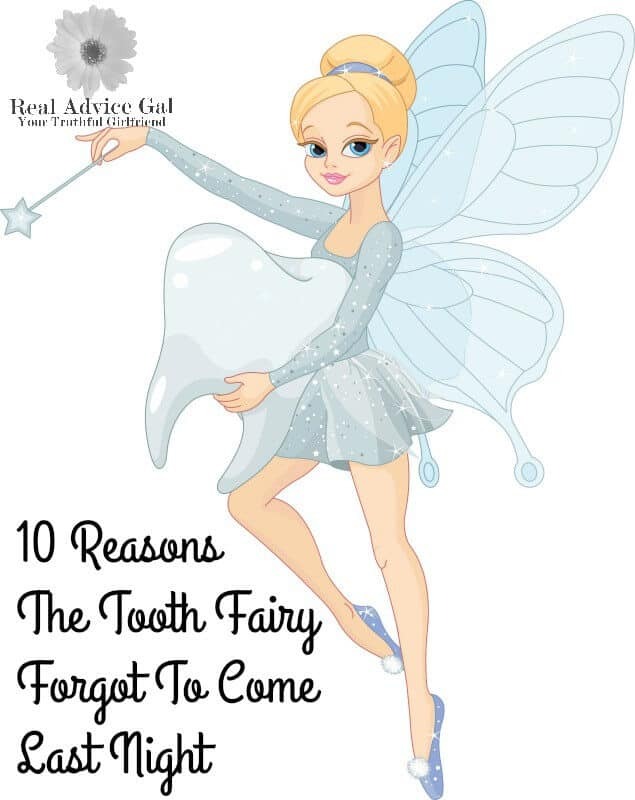 And of course, we know the main reason they are excited is because they get a visit from the tooth fairy! They stick their now lost tooth in a bag, under their pillow and wake up the next morning and what do they find? Their tooth still there because oops, you forgot to put on your wings last night. But now that you have forgotten to leave treasures from the tooth fairy, now what? Well, first I would recommend soothing your (probably) upset child, and assuring them that you are sure the tooth fairy has a good reason for not showing up last night (which may or may not include being tired, having no cash on them, or forgetting to set an early alarm to sneak in their room before they woke up….). Next, it’s time to think of an excuse. Which is why you are here right? I got you covered! There was a big fairy meeting that ran over so she is running behind. She was called to help one of Santa’s elves who had come down with a terrible tooth ache! She got confused and went to the wrong room last night! In fact, you are pretty sure you saw her in your room! Have the kids make a sign pointing her to the right room this time. Ta-da! Make a pretty little note to your mini-humans to explain why the tooth fairy forgot to visit along with the missed payment and all is forgiven. And you are Super Mom once more!